1. Defrost frozen puff pastry by leaving on the counter for 40 minutes or overnight in the fridge. Be prompt about using it after the defrost time because it comes folded and can stick together if left out of the freezer too long. 2. Combine ground turkey and country sausage together. Add minced onions, salt and pepper and mix well. 3. Form meat into 36 firm, one-ounce meatballs. A cookie scoop works great for measuring, then just press meat together until a firm meatball. 4. Heat olive oil in frying pan on medium-high heat. 5. Brown burgers in frying pan. It usually takes about three turns each to brown the entire meatball. You never want to ever under cook pork or chicken but in this case, there will be more cooking time in the oven so to prevent the meat from becoming too dry, just brown them for now. 6. Place burgers on a tray. Set aside. 7. Whisk together brown sugar and cornstarch in a medium-large saucepan but do not turn burner on. Add chicken broth & balsamic vinegar and whisk all ingredients together before turning burner on. Add salt and pepper. Cook over medium-high heat, stirring once & awhile so that it doesn't burn. Cook until sauce boils and you can see that it has begun to thicken. Sauce will continue to thicken. Remove from heat and set aside. 8. Preheat oven to 400F. This is very, very important. If you do not preheat your oven, things will not cook properly -- especially puff pastry. It will come out soggy and limp instead of puffed and flaky. 9. Using a little flour and a rolling pin, roll out 4 puff pastry sheets and then cut into 9 squares each. 10. Finely chop herbs. Mix cream cheese together with the fresh herbs. 11. Place 1 tablespoon of cream cheese mixture in the middle of each puff pastry square. 12. Place one burger on each puff pastry square on top of the cream cheese. 13. 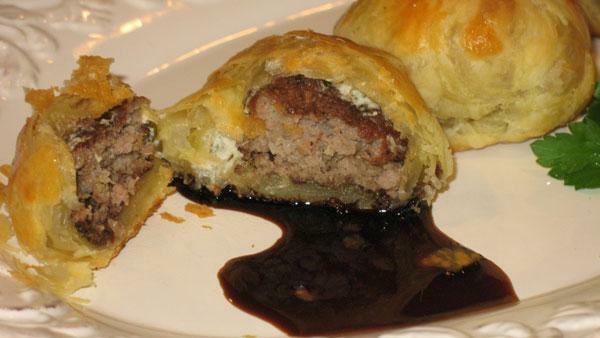 Fold four corners of puff pastry up around the burgers until they meet in the middle. Press together. Close up additional openings so that the puff pastry "hugs" each burger. 14. Turn Saucy Balsamic Burgers over and place on parchment paper-lined baking sheet. You can fit 18 on each baking sheet (3 rows of 6). 15. After all burgers are wrapped, use beaten egg to brush top of each puff pastry so that they will become golden brown and shiny while baking. 16. Bake burgers for 25 minutes or until pastry is puffed, flaky and light golden brown. 17. Serve with warmed sauce and garnish with parsley if you like. These make a perfect tray of 36 appetizers. Perfect served with a salad or fresh fruit. Saucy balsamic burgers can also be made larger for a main course. Saucy balsamic burgers can be made in advance. Follow all steps except baking. Save burgers on the sheet pan, wrap in plastic wrap and refrigerate. Refrigerate sauce as well. Brush with egg wash and bake just 25 minutes before you need them ready and reheat sauce.